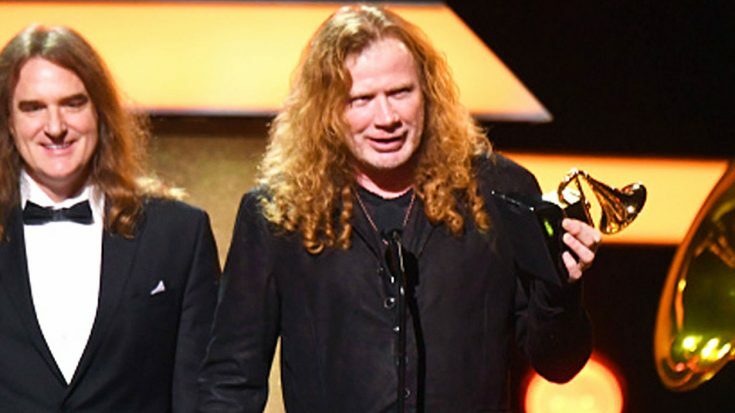 Dave Mustaine Responds To GRAMMYs For Metallica Mistake, And Doesn’t Hold Back! Lost in all of the craziness of the GRAMMYs main show where all of the performances and main presentations occur, was the pre-show. For those who are unaware the pre-show takes place before the main event, and is the event where a majority of the smaller or less popular awards are presented. This year at the pre-show, Megadeth‘s latest album Dystopia won the GRAMMY for best metal performance. The announcement was met with cheers, but there was one major mistake…as the band was walking toward the stage to accept the award, the GRAMMY house band began playing Metallica’s “Master of Puppets.” Many metal fans were pretty outraged by the mistake, but Mustaine and the band played along with it, and began playing the riff on air guitar as they walked toward the stage. With the outrage from fans, Mustaine has finally spoken about the incident, and his reaction was actually light-hearted! You can’t blame Dave for laughing it off! It wasn’t that much of a catastrophe, and they still got their award! Relive the moment down below! He also made a hilarious reference to 69!